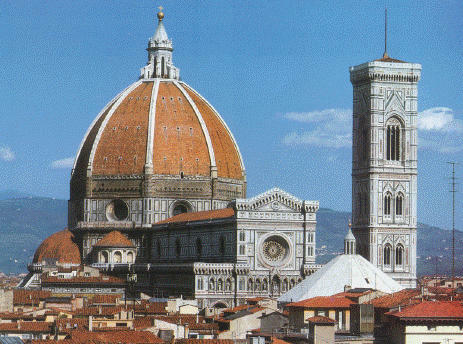 Everyone knows Brunelleschi for his cathedral dome, symbol and pride of the Florentines. But there is a lot more to the story. If he had not preferred to practice architecture, Brunelleschi might have been equally renowned as a sculptor, painter or whatever else he set his hand to. One of the greatest of architects, the inventor of scientific perspective and much else, he is one of the founders of the Renaissance. Filippo di Ser Brunellesco Lati (1377–1446) was the son of a minor Florentine official, and unlike most artists of the time he received a good classical and practical education. Like Botticelli, he started out as a goldsmith. In those early years he visited Rome with his good friend Donatello. Here he became infatuated with the ruins of classical architecture that lay all about; he started sketching them, and recorded his observations and measurements in cipher in his notebooks. When he wasn't learning the secrets of the old Romans, Brunelleschi like to fool with gadgets; he's credited as making the first working alarm clock. Back in Florence, work as a goldsmith was excellent training for sculpture, and Brunelleschi fancied his odds in the great competition (1401) to make the Baptistry's bronze doors. He lost that prize to Ghiberti, who would be his rival and nemesis for the rest of his life. After the competition, Brunelleschi passed through a rather quiet fifteen years. He was continuing to make sculpture, as at Orsanmichele and Santa Maria Novella, and he was already employed at the workshop of the Duomo. He worked in Prato and Pisa. In 1416, back in Florence, he changed the course of art with his famous demonstrations of scientific perspective, using the Baptistry as a model. The big breaks began in 1418, when Brunelleschi entered the competition for the long-delayed dome of the Duomo. Just after that he received the commission for what would be one of the Renaissance's seminal works, the Ospedale degli Innocenti. Despite a full-time occupation with the dome, he still was able to work on other important projects. Florence and the Medici were loaded with cash, and Brunelleschi was the man of the hour. He perfected his personal style: classical domes and colonnades refashioned for a new era, with cool, white interiors highlighted by trim in pietra serena. 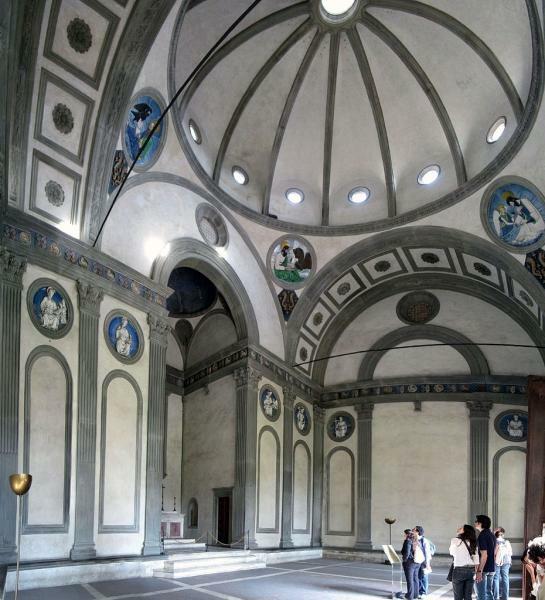 In this vein, he designed the Medici church, San Lorenzo, the Pazzi Chapel at Santa Croce, and Santo Spirito. Equally renowned as a military engineer, he built walls and fortresses all over the lands in Florence's control. Other architectural works of his include additions to the Palazzo di Parte Guelfa, the Capella Barbadori at Santa Felicità and the incomplete project of the Rotonda di Santa Maria degli Angeli. 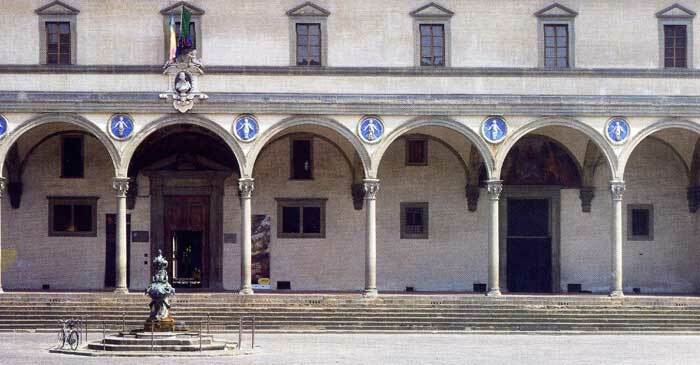 He may also have contributed the original design for the Palazzo Pitti. After his death in 1446 Brunelleschi was afforded the rare honour of burial in the Duomo. Brunelleschi's adopted son Andrea Cavalcanti, also known as 'Il Buggiano', was a talented sculptor and architect who went wrong. He worked with some of the greats, including Donatello (tomb of Giovanni di Bicci in San Lorenzo) and performed decorative work on the Duomo and other projects, but when Florence briefly imprisoned Brunelleschi for unpaid taxes Cavalcanti took all his wealth (he claimed he was owed it) and fled to Naples. After a papal pardon he returned to Florence and sculpted his father's tomb; he quickly blew through his considerable inheritance from Brunelleschi and faded into obscurity.